We’ve launched a couple of successful AdWords remarketing campaigns, so we are happy to share what’s the magic behind them. Get inspired how to constantly generate high sales from remarketing! It’s not a surprise if we say the remarketing or retargeting campaigns are the ones with possibly the biggest potential in the world of PPC advertising. The reason is simple. We target people, who already visited or interacted with our website. Briefly said, it’s the only advantage, however, it’s the biggest. Can you imagine publishing a banner persuading your customer to buy a flat-screen TV right after they bought one? It’s not personalised. To be honest, it’s completely useless. Additionally, these campaigns perform with awful CTRs and with low or zero conversion rates. However, we notice thousands of these banners online every single day and advertisers keep wondering why their ROI is so poor. There are numerous styles how to classify the information about the website visitors in order to create remarketing lists, notwithstanding, you need to follow their behaviour. This will enable you to target your AdWords remarketing precisely with customised messages and offers. Would you like to set up effective remarketing lists based on the real behaviour of visitors? Read the next blog post! We’ve created a couple of remarketing lists both in Google AdWords and Analytics. All of them are based on the behaviour of our visitors. More sophisticated working with various metrics can be done with Analytics. Once the number of users in the lists was sufficient, we started launching various campaigns. The point of remarketing is to target potential or existing customers with made-to-order offers. This campaign is based on what type of customers we planned to approach: free or paid. Another campaign deals with visitors who visited specific sections of our websites and/or apps but haven’t signed up. Therewith, we have launched a campaign aimed at users who visited the pricing section but haven’t subscribed. Tip: We can work with countless scenarios. To test different combinations of remarketing lists isn’t much time consuming and it can end up with extraordinary sales. 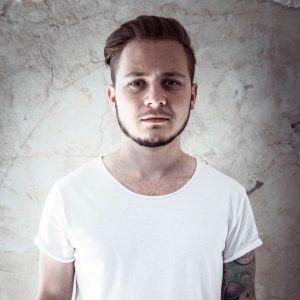 Let’s take a look at one of the campaigns. Our objective was to target registered users using the free plan to motivate them to subscribe to one of the paid plans. 1. We set up the list with specific conditions and waited for enough users. Screenshot 1: AdWords remarketing lists. 2. 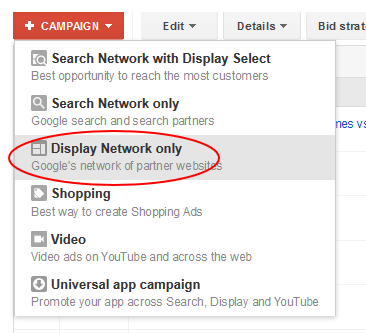 We started setting up the “Display Network only” AdWords remarketing campaign. Screenshot 2: Creating AdWords remarketing campaign. 3. The next step was to select the “Marketing objective”. We went for “Buy on your website” as we wanted our free users to become the paid ones. 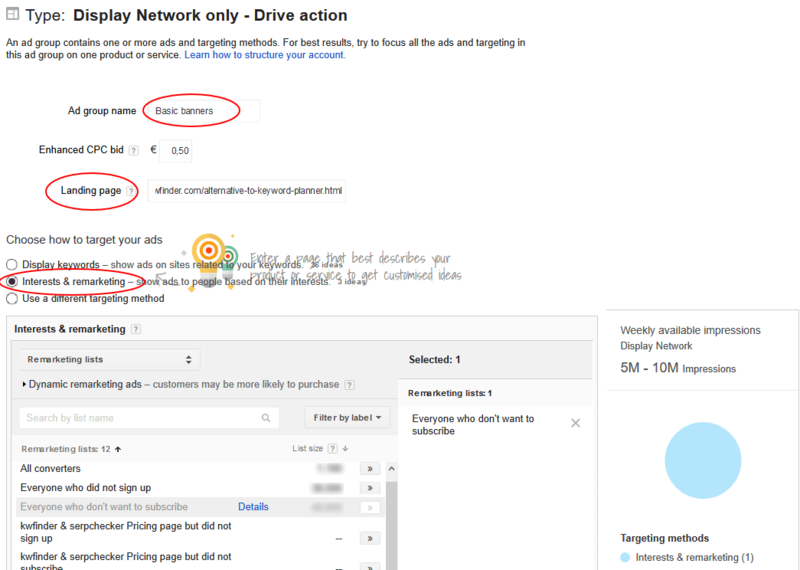 Screenshot 3: Setting up a goal in AdWords remarketing campaigns. 4. We created the first “Ad group”. We named it accordingly to differentiate the groups and copied a tracking link with UTM parameters leading to a prepared landing page. Finally, we could select the remarketing list, the most crucial ingredient. Ad group name, CPC bid, landing page and targeting in AdWords remarketing campaigns. 5. We uploaded banners and waited until Google approves them. 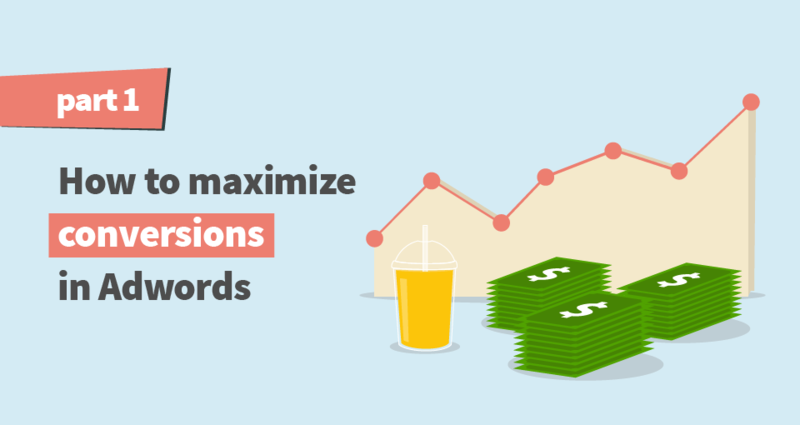 Thanks to the above-explained list creation and ads we managed to generate loads of conversions. Based on our LTV and the costs, we can say the ROI is tremendous! It’s above 5,000%. Does it sound unreal? Well, we thought the same when we were hit by the numbers. We tried the identical strategy for other AdWords remarketing campaigns and the results were essentially the same. Indeed, we launched and will launch campaigns with unsatisfying results. There’s no doubt about it. Testing the best practices is a powerful way how to receive the desired outcome. Recently, we launched a bit riskier remarketing campaign. Our intention was to convert visitors, who visited specific sections on our website but haven’t even registered. It means skipping the free plan period. It paid off! The ROI oscillates around 4,500%. What do you think? Will you try the same tactics to boost your sales in PPC advertising? Let us know your thoughts and experience in the comments below.